Most of the world lives in cities. That number, now at about 3.3 billion people, will keep going up. During the next five years, urban populations are expected to soar well beyond half the world’s total. Yet most of those urbanites are also likely to live in poorly, or at least haphazardly, designed cities. The expertise to create a well-planned metropolis is seldom available, especially in the developing world, where 30% of urban populations live in informal slums. Globally, 70% of today’s urban growth (PDF) occurs outside the formal planning process. If nothing changes, the inefficiencies, pollution, and misery of modern dysfunctional cities may become the norm. Avoiding that future just became a bit easier with the launch of the Urban Network Analysis, an open-source software released by MIT. 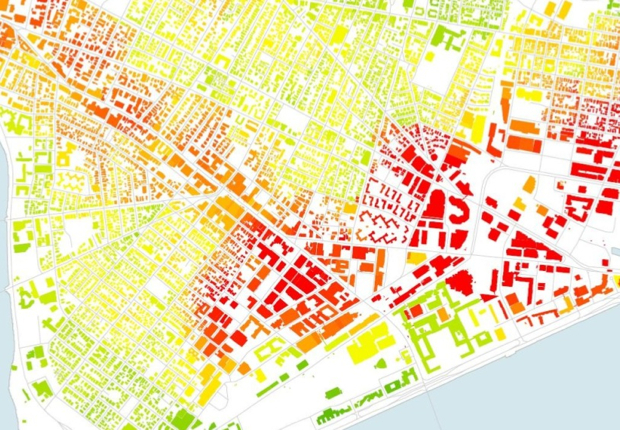 Taking a cue from social networks and mathematical network analysis methods, the City Form Research Group‘s program calculates how a cities’ spatial layout affects the way people will live in it. It measures traits such as “reach, gravity, betweenness, closeness, and straightness,” which, in laymen terms, express features such as the number of services, buildings, and resources within a certain walking distance, or the volume of traffic along sidewalks and streets. Designers can also assign characteristics to individual buildings, as well as track urban growth and change with analytic support for policy makers. What this means is that city planners can look at their cities and see, for instance, that some neighborhoods are closer to jobs than others (the map at the top is the “reach” map for jobs in Cambridge, MA. Red means closer to jobs). Knowing this, planners might want to build transportation from green areas to red areas. It can also predict things like street traffic: Good to know if you want to create a commercial zone where you will need walk-in customers. Until now, claims MIT, no free tools were available for city planners to tackle the tough computational challenges of characterizing the dense tangle of streets, buildings, and transport in modern cities. MIT hopes the UNA toolbox, an open-source plug-in for the ArcGIS mapping program, will enable urban designers, architects, planners, and geographers around the world to better understand how the spatial patterns of cities will affect the way people live and move around their urban environments. The UNA toolbox can be downloaded here.